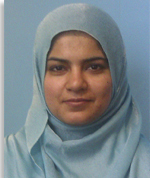 Dr. Toor-e-Aiman Rizvi obtained her first class B.Sc. Chemical Engineering degree from the University of Engineering and Technology, Lahore in 2007. She then received three gold medals for securing an overall first position in MSc. Chemical Engineering from the University of Punjab, Lahore in 2010. She was awarded the degree of Doctor of Philosophy by the School of Chemical and Process Engineering, University of Leeds, UK in 2015. She has five international journal and conference publications to date. Her area of expertise includes coal and biomass combustion, fireside degradation in boilers, environmental aspects of solid-fuels combustion.